WASHINGTON — The New York Times and The Guardian have published a selection of the 250,000 classified State Department documents provided to them by the online website WikiLeaks. The WikiLeaks website appeared to be inaccessible, and WikiLeaks said in its Twitter feed that it was experiencing a denial of service attack. WikiLeaks also provided the documents to Spain’s El Pais, France’s Le Monde, and Germany’s Der Spiegel. Meanwhile, another cable shows that a 2009 claim by Prime Minister Benjamin Netanyahu that Iran was months away from achieving military nuclear capability was dismissed by the Americans as a ploy.According to German weekly Der Spiegel, which also received advance information from WIkiLeaks, a State Department official says in a classified cable that Netanyahu informed the United States of Iran’s nuclear advancement in November 2009, but that the prime minister’s estimate was likely unfounded and intended to pressure Washington into action against the Islamic Republic. How does one deal with the conservatives at the family table while avoiding a massive food fight? Stay calm and relaxed, and follow these simple guidelines. Maybe your brother-in-law works on Wall Street and declares he wants to see the Bush tax cuts extended indefinitely as he scoops himself a generous portion of mashed potatoes. Or perhaps your aunt mentions, while checking on the turkey, that Sarah Palin is her role model and she can’t wait to follow her Rupert Murdoch-sponsored book tour from city to city. Or maybe, over a slice of pumpkin pie and coffee, your grandfather suggests that the Tea Party’s ideas aren’t half bad, and he likes that Rand Paul fella because he’s really getting the government out of people’s Medicare. As tempting as it will be to ask sarcastic questions about teabagging and what kind of scones are served at Tea Parties, that will only get you so far. And you don’t want to ruin your appetite. It’s Thanskgiving, after all. So how does one deal with the conservatives at the family table while avoiding a massive food fight? Stay calm and relaxed, and follow these simple guidelines. Why Do Americans Keep Getting Suckered By Right-Wing Lies? Until progressives change the mind sets of the tens of millions who believe right-wing mythology, elections will be disappointing regardless of who is in the White House. Ideas don’t happen on their own. Throughout history ideas need patrons.” —Matt Kibbe, president of Freedom-Works, a tea party advocacy group, quoted in Jane Mayer’s piece on the Koch brothers in The New Yorker. NEW YORK — For at least the fourth time since June, Federal Reserve Chairman Ben Bernanke publicly urged Congress to combat the lackluster recovery by increasing government spending, a recommendation that has gone unheeded by lawmakers. In a speech at a conference of central bankers in Frankfurt, Bernanke once again said the Fed cannot save the economy on its own. The Fed’s recent move to add to its ballooning balance sheet by committing to buy up to $600 billion of government debt faces “limits” to its effectiveness, Bernanke said. The rest of the government, the chairman added, could aid the Fed’s efforts by hammering out a plan for stimulative spending. The right kind of spending, he noted, could help reduce the budget deficit over the long-term by first boosting economic growth. 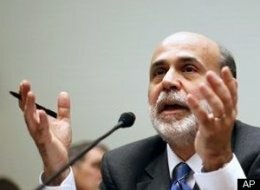 “[I]n general terms, a fiscal program that combines near-term measures to enhance growth with strong, confidence-inducing steps to reduce longer-term structural deficits would be an important complement to the policies of the Federal Reserve,” Bernanke said Friday, according to his written remarks. The fiscal policy recommendation came directly after Bernanke acknowledged it isn’t his job to make such policy proposals. “The Federal Reserve is nonpartisan and does not make recommendations regarding specific tax and spending programs,” the chairman noted. The official parameters of his job, though, have not stopped Bernanke from engaging in backseat driving. At least four times since June — on June 9, July 21, July 22 and now Friday — he has urged lawmakers to increase spending to jumpstart the lagging economy. But policy makers have proved to be unable to agree upon such a plan — or even propose one that’s viable. The rest of the nation has suffered as a result, as near-10 percent unemployment continues to hobble the economy. Democrats recently lost control of the House of Representatives, and a substantial part of their majority in the Senate. Voters said the dismal economy was their top concern. To combat an ineffectual Washington establishment, the Fed has taken matters into its own hands. By buying up to $600 billion of government debt, the central bank hopes to increase the flow of money through the economy. Critics of the program, which is intended to lower interest rates and encourage corporate spending, have said the cheap money will not convince businesses to create jobs. If people didn’t like the federal stimulus, they may hate when it’s gone. As the year winds down, the $862 billion plan to rescue the economy from the depths of the recession enters a new phase in which tax cuts and credits expire and countless hard-to-replace construction projects will end. Thousands of workers in some states could lose their jobs. The political power shift brought about by the midterm elections has likely settled any lingering doubts that the stimulus will largely run out, as scheduled, in the coming months. A smaller package of federal aid that passed in August, primarily for teachers, also will rapidly disappear. With the new Republican majority in the House next year, there will be little support for similar additional measures. Worries about the national debt and a negative view of the stimulus augur a new period when more businesses must survive on their own and governments must tighten their belts. The austerity will be widely felt. Nearly every worker in the nation will see slightly slimmer paychecks as $400 individual tax cuts are slated to end this year. Tax credits, such as those offering incentives for energy-efficiency improvements for homeowners, also are set to lapse at year’s end. The earned-income tax credit, which rewards the working poor, will no longer include funding for those with a third child.